David Bowie’s career as a pioneering artist spanned nearly 50 years and brought him international acclaim. He continues to be cited as a major influence on contemporary artists and designers working across the creative arts. This book, published to accompany the blockbuster international exhibition launched at London’s Victoria and Albert Museum, is the only volume that grants access to Bowie’s personal archive of performance costumes, ephemera, and original design artwork by the artist, bringing it together to present a completely new perspective on his creative work and collaborations. 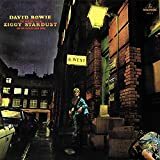 The book traces his career from its beginnings in London, through the breakthroughs of Space Oddity and The Rise and Fall of Ziggy Stardust and the Spiders from Mars, and on to his enormous impact on 20th-century avant-garde music and art. Essays by V&A curators on Bowie’s London, image, and influence on the fashion world are complemented by Howard Goodall on musicology; Camille Paglia on gender and decadence, and Jon Savage on Bowie’s relationship with William Burroughs and his fans. The more than 300 color illustrations include personal and performance photographs, album covers, costumes, original lyric sheets, and much more. On the January 10th 2016, the world lost a hero. Here are some of his most provocative and memorable sayings to inspire and treasure. "I don't know where I'm going from here, but I promise it won't be boring." "I re-invented my image so many times that I'm in denial that I was originally an overweight Korean woman." "I've never responded well to entrenched negative thinking." "I'm an instant star. Just add water and stir"
This is the perfect memento or gift for any Bowie fan and an affectionate tribute to a true icon. Dylan Jones’s engrossing, magisterial biography of David Bowie is unlike any Bowie story ever written. 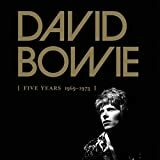 Drawn from over 180 interviews with friends, rivals, lovers, and collaborators, some of whom have never before spoken about their relationship with Bowie, this oral history weaves a hypnotic spell as it unfolds the story of a remarkable rise to stardom and an unparalleled artistic path. Tracing Bowie’s life from the English suburbs to London to New York to Los Angeles, Berlin, and beyond, its collective voices describe a man profoundly shaped by his relationship with his schizophrenic half-brother Terry; an intuitive artist who could absorb influences through intense relationships and yet drop people cold when they were no longer of use; and a social creature equally comfortable partying with John Lennon and dining with Frank Sinatra. By turns insightful and deliciously gossipy, David Bowie is as intimate a portrait as may ever be drawn. It sparks with admiration and grievances, lust and envy, as the speakers bring you into studios and bedrooms they shared with Bowie, and onto stages and film sets, opening corners of his mind and experience that transform our understanding of both artist and art. Including illuminating, never-before-seen material from Bowie himself, drawn from a series of Jones’s interviews with him across two decades, David Bowie is an epic, unforgettable cocktail-party conversation about a man whose enigmatic shapeshifting and irrepressible creativity produced one of the most sprawling, fascinating lives of our time. Follow every step of David Bowie’s career; from Ziggy Stardust to Tin Machine, from “Space Oddity” to Let’s Dance to Blackstar, in Bowie: The Illustrated Story. David Bowie released an incredible 27 studio albums, beginning with his eponymous 1967 debut and ending with Blackstar, released just two days before his untimely death in January 2016. Widely regarded as one of the most influential musicians and performers of the previous five decades, Bowie demolished what were thought to be the limitations of stagecraft in rock music, as well as proving it possible for an artist to constantly--and successfully--redefine himself. As a result, Bowie has been credited with inspiring genres as disparate as glam and punk rock. 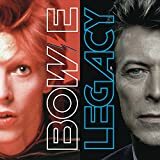 This sharply written and gorgeously designed retrospective follows Bowie’s career from the folkie baroque rock of his debut, to his breakthrough single “Space Oddity,” and on to his flamboyant glam rock alter ego, Ziggy Stardust. Author Pat Gilbert continues through Bowie’s soul phase, his electronic Berlin trilogy, his massive pop success in the 1980s, and his turn to electronica in the 1990s, as well as subsequent tours, notable performances, collaborations, and accolades. Nearly every page is illustrated with stunning concert and candid offstage photography, including gig posters, 7-inch picture sleeves, concert ticket stubs, and more. The result is a fitting tribute to one of the most influential and admired stars in rock history. Chameleonic, hypnotising and utterly irreplaceable, David Bowie was more than just a pop star. More underdog than diamond dog, he was an inspiration to millions: a hot tramp from the streets of London, who proved that anything’s possible when you follow your dreams. Whether posing as an electrifying alien rock god or a thin white duke, Bowie’s career is a veritable kaleidoscope of ever-changing colors, styles and sounds. From Aladdin Sane to Ziggy Stardust, from Goblin King to China boy, from sharp-suited aristocrat to androgynous bohemian Queen, Starman collects black-and-white sketches of his most iconic looks, stardusted visions and stylistic moments. Filled with quotes, facts and memories of Bowie from those who knew him best, David Bowie: Starman offers a uniquely creative way to remember the Starman and his incredible life on Earth  essential reading for fans of every generation. ― Mick Rock, 2016A unique tribute from David Bowie’s official photographer and creative partner, Mick Rock, compiled in 2015, with Bowie’s blessing. In 1972, David Bowie released his groundbreaking album The Rise and Fall of Ziggy Stardust and the Spiders from Mars. With it landed Bowie’s Stardust alter ego: a glitter-clad, mascara-eyed, sexually ambiguous persona who kicked down the boundaries between male and female, straight and gay, fact and fiction into one shifting and sparkling phenomenon of ’70s self-expression. Together, Ziggy the album and Ziggy the stage spectacular propelled the softly spoken Londoner into one of the world’s biggest stars. A key passenger on this glam trip into the stratosphere was fellow Londoner and photographer Mick Rock. Rock bonded with Bowie artistically and personally, immersed himself in the singer’s inner circle, and, between 1972 and 1973, worked as the singer’s photographer and videographer. This collection, featuring around 50 percent previously unpublished images, brings together spectacular stage shots, iconic photo shoots, as well as intimate backstage portraits. With a lenticular cover of different headshots, it celebrates Bowie’s fearless experimentation and reinvention, while offering privileged access to the many facets of his personality and fame. Through the aloof and approachable, the playful and serious, the candid and the contrived, the result is a passionate tribute to a brilliant and inspirational artist whose creative vision will never be forgotten. 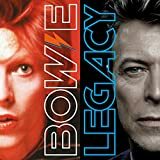 Critically acclaimed in its previous editions, The Complete David Bowie is widely recognized as the foremost source of analysis and information on every facet of Bowie’s career. The A-Z of songs and the day-by-day dateline are the most complete ever published. From the 11-year-old’s skiffle performance at the 18th Bromley Scouts’ Summer Camp in 1958, to the emergence of the legendary lost album Toy in 2011, to his passing in January 2016, The Complete David Bowie discusses and dissects every last development in rock’s most fascinating career. * The Albums – detailed production history and analysis of every album from 1967 to the present day. 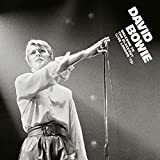 * The Songs – hundreds of individual entries reveal the facts and anecdotes behind not just the famous recordings, but also the most obscure of unreleased rarities – from ‘Absolute Beginners’ to ‘Ziggy Stardust’, from ‘Abdulmajid’ to ‘Zion’. * The Tours – set-lists and histories of every live show. * The Actor – a complete guide to Bowie’s career on stage and screen. * Plus – the videos, the BBC radio sessions, the paintings, the Internet and much more. From the ultimate David Bowie expert comes an exploration of the final four decades of his musical career, covering every song he wrote, performed or produced. 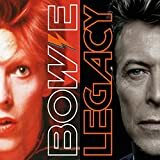 From the ultimate David Bowie expert comes this exploration of the final four decades of the popstar's musical career, covering every song he wrote, performed or produced from 1976 to 2016. 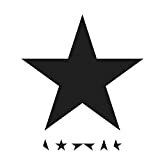 Starting with Low, the first of Bowie's Berlin albums, and finishing with Blackstar, his final masterpiece released just days before his death in 2016, each song is annotated in depth and explored in essays that touch upon the song's creation, production, influences and impact. David Bowie: Behind The Curtain is a rare, exclusive, intimate, and very candid look at David Bowie during the rise of the Thin White Duke, his Station to Station tour, and numerous larger-than-life stories along the way. In 1975, rock 'n roll photographer Andrew Kent landed the gig of a lifetime. He had been entrusted by Bowie to document, with unfettered access, anything and everything Bowie and his entourage encountered for the next two years. Backstage, on stage, private parties, birthday parties, limos, quiet hotel moments, dressing rooms, Berlin, Paris, New York, London, Helsinki, Moscow. Also along during the Station to Station tour was an 18 year old Rolling Stone reporter researching a cover story on Bowie named Cameron Crowe. In 1976 Bowie took Iggy Pop, his manager Pat Gibbons, his personal secretary Coco, and Kent on an impromptu excursion by train to the Soviet Union. A mistake on the schedule at the train station caused the group to miss their return train to Helsinki leading the press to run frenzied headlines reading, "David Bowie Missing in Soviet Union!." With his unprecedented access, Kent created a one-of-a-kind travelogue, capturing the unique and spectacular life of one of the most iconic musicians in rock 'n roll history. In Ricochet, the official photographer of one of the most celebrated musicians of all time reveals intimate stories and pictures that offer an exclusive insight into David Bowie, the man and musician. Taken on the "Serious Moonlight Tour"—Bowie's largest ever tour that took in 99 concerts in over 60 cities—Denis's photos provide a thrilling, intimate view of life on the road with a unique pop icon. From capturing the theater and mime of Bowie on stage to unguarded snapshots of the artist at his most human, every single image in Ricochet was personally approved by Bowie himself, and the result is a music photography book like no other. Witty, poignant, and beautifully produced, Ricochet is a rare and spirited look into the life of an inimitable artist, whose music and performances have inspired—and continue to inspire—generations of listeners around the world. Let's dance to our favorite songs by one of the most versatile artists to ever do it. 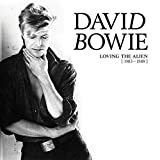 DAVID BOWIE ‘LOVING THE ALIEN (1983 – 1988)’ contains a brand new production of the 1987 album ‘NEVER LET ME DOWN’ by Bowie producer / engineer Mario McNulty with new instrumentation by Bowie collaborators Reeves Gabrels (guitar), David Torn (guitar), Sterling Campbell (drums), Tim Lefebvre (bass) as well as string quartet with arrangements by Nico Muhly and a guest cameo by Laurie Anderson on ‘Shining Star (Makin’ My Love)’. The eleven CD box is named after the opening track from the ‘Tonight’ album and includes newly remastered versions of David’s most commercially successful period ‘LET’S DANCE’, ‘TONIGHT’, ‘NEVER LET ME DOWN (ORIGINAL and 2018 VERSIONS)’, the live album ‘GLASS SPIDER (Live Montreal ’87)’, the previously unreleased ‘SERIOUS MOONLIGHT’ live album, a collection of original remixes entitled ‘DANCE’ and the non-album / alternate version / b-sides and soundtrack music compilation RE:CALL 4. 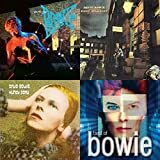 A selection of Bowie's most popular tracks and singles, from 1969's "Space Oddity," through to the final singles "Lazarus" and "I Can't Give Everything Away", issued earlier this year. The Legendary Full Performance Released For The First Time Including Many Of Bowie's Greatest Hits And Never Before Seen Footage. This releasedocuments Bowie's legendary Sunday night headline performance on June 25 at the most famous festival on earth. 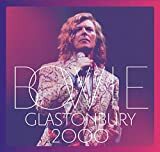 The package includes the full 21 song greatest hits set and for the first time, a DVD of the entire show (only 30 minutes of which has ever been broadcast on TV) including the Glastonbury performance of "'Heroes'," a highlight of the record breaking "David Bowie Is..." exhibition and the only track that has been previously released. 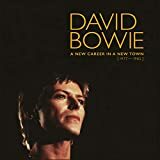 DAVID BOWIE ‘A NEW CAREER IN A NEW TOWN (1977 – 1982)’ is the third in a series of box sets spanning his career from 1969 and the follow-up to the awarding winning and critically acclaimed DAVID BOWIE ‘FIVE YEARS (1969 – 1973)’ and DAVID BOWIE ‘WHO CAN I BE NOW? (1974 – 1976)’. 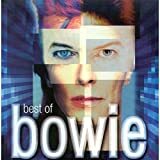 This 11CD box set features features all of the material officially released by David Bowie between 1977 and 1982 including all four studio albums, his 1978 live album ‘STAGE’ in both original and expanded tracklistings, the newly compiled “HEROES” E.P., collecting together both the German and French long and single versions of “Heroes”, and the exclusive new compilation of single versions, non-album singles and B-sides, ‘RE:CALL 3’. Also included exclusively is a brand new remix of the 1979 album ‘LODGER’ by long time Bowie producer/collaborator Tony Visconti. The ‘BAAL’ EP appears here for the very first time in its entirety on CD, while ‘Beauty And The Beast’ (extended version) and ‘Breaking Glass’ (Australian single version) are making their debuts on CD, all on ‘RE:CALL 3’. The CD box set includes faithfully reproduced mini-vinyl versions of the original albums, and the CDs are gold coloured rather than the usual silver. The box set’s accompanying 128 page book features rarely seen and previously unpublished photos by photographers including Anton Corbijn, Helmut Newton, Andrew Kent, Steve Schapiro, Duffy and many others as well as historical press reviews and technical notes about the albums from producer Tony Visconti. 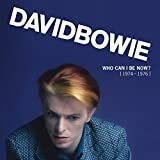 Parlophone Records are proud to announce DAVID BOWIE WHO CAN I BE NOW? (1974 1976), the second in a series of box sets spanning his career from 1969. 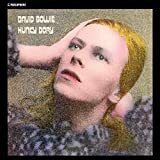 The follow up to the awarding winning and critically acclaimed DAVID BOWIE FIVE YEARS (1969 1973) will be released on 23rd September and will contain the previously unreleased album from 1974 called THE GOUSTER . The twelve CD box features all of the material officially released by Bowie during the so-called American phase of his career from 1974 to 1976. The box set, which is named after a track recorded in 1974 but not officially released until the 1990s, includes DIAMOND DOGS , DAVID LIVE (in original and 2005 mixes), YOUNG AMERICANS and STATION TO STATION (in original and 2010 mixes) as well as THE GOUSTER , LIVE NASSAU COLISEUM 76 and a new compilation entitled RE:CALL 2 which is a collection of single versions and non-album b-sides. All of the formats include tracks that have never before appeared on CD/vinyl/digital as well as new remasters. Exclusive to the box set is THE GOUSTER previously unreleased as a complete album it was recorded at Sigma Sound, Philadelphia in 1974 and produced by Tony Visconti. The album was mixed and mastered before David decamped to New York to work with John Lennon and Harry Maslin on what became the YOUNG AMERICANS album. THE GOUSTER contains three previously unreleased mixes of Right , Can You Hear Me and Somebody Up There Likes Me . For the 2016 release, Tony Visconti has overseen the mastering from the original tapes and photos taken by Eric Stephen Jacobs have been put together for the sleeve based around one of David s original concepts for the album. Also exclusive to the package is the remastered DAVID LIVE (original mix) , the 2010 Harry Maslin mix of STATION TO STATION (previously only available on an audio only DVD in 5.1 and stereo as part of the STATION TO STATION Deluxe box set in 2010) and RE:CALL 2 . RE:CALL 2 features the original single mix of Rebel Rebel , which has only featured on a 40th anniversary picture disc in 2014 since its original release on single in 1974, and a previously unreleased on CD Australian single edit of Diamond Dogs , the only place in the world that this edit was issued. Also appearing on CD for the first time is the single edit of the live version of Rock n Roll With Me , which was issued to radio stations in the U.S. to help promote the DAVID LIVE album. RE:CALL 2 features newly originated artwork with 1975 in-studio images from the STATION TO STATION recording sessions by David s friend and backing vocalist Geoff MacCormack aka Warren Peace. The alternative cover for the 2010 mix of STATION TO STATION by Harry Maslin, features the originally intended colour sleeve for the album that never got further than a few colour proofs and was replaced by the more familiar black and white image. The box sets accompanying book, 128 pages in the CD box and 84 in the vinyl set, will feature rarely seen and previously unpublished photos by photographers including Eric Stephen Jacobs, Tom Kelley, Geoff MacCormack, Terry O Neill, Steve Schapiro, and many others as well as historical press reviews and technical notes about the albums from producers Tony Visconti and Harry Maslin. The CD box set will include faithfully reproduced mini-vinyl versions of the original albums and the CDs will be gold coloured rather than the usual silver. The 12-CD box feature all of the material officially released by Bowie during the nascent stage of his career from 1969 to 1973. All of the formats include tracks that have never before appeared on CD/digitally as well as new remasters. The boxed set accompanying book, 128 pages in the CD box, will feature rarely seen photos as well as technical notes about each album from producers Tony Visconti and Ken Scott, an original press review for each album, and a short foreword by legendary Kinks front man Ray Davies. The CD boxed set will include faithfully reproduced mini-vinyl versions of the original albums and the CDs will be gold rather than the usual silver. 2002 collection from one or Rock music's most influential artists. 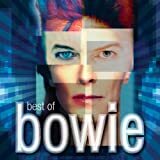 Features 20 tracks including 'Changes', 'Space Oddity', 'Fame', 'Let's Dance', 'China Girl', 'Ashes To Ashes' and more. This is the CD debut of Welcome To The Blackout (Live London ’78). This live album features performances recorded at Earl’s Court in London on 30 June and 1 July, 1978 during Bowie’s “Isolar II” Tour. 7"vinyl singles box set of nine previously unreleased recordings from the era during which Space Oddity was first conceived. The title ‘Spying Through A Keyhole’ is a lyric taken from the previously unknown song, Love All Around, and though most of the other titles are known, these versions have never been officially released until late 2018. Most of the recordings are solo vocal and acoustic home demo performances, unless otherwise stated. The design of each single label is presented to reflect the way David sent many of his demos to publishers and record companies, featuring his own handwritten song titles on EMIDISC acetate labels. The singles themselves are all mono and play at 45 r.p.m. Please Note: This website is NOT associated with any celebrity. All products (including but not limited to books, DVDs, movies, CDs, posters, etc.) linked or described on this website, are advertisements for products being offered by third parties (principally Amazon.com and AllPosters.com). All images of celebrities are advertisements for posters (through the AllPosters affiliate program) or other products offered for sale by these third parties.